Understanding the renowned stone itself. Fostering community support and esteem, supporting local projects and celebrations. Established the Sandstone Society Hall of Fame. Marking special sites with engraved sandstone tablets. Using grants and gifts to protect and save worthy structures. Publishing texts of local interest. Saluting Medina’s status as an Erie Canal port. 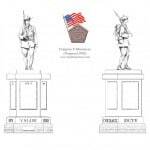 Sponsoring “walking tours” of historic sites. Recruiting auxiliary associates called “Stone Cutters”. 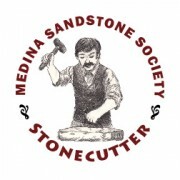 Establishing a Medina civic endowment named the Sandstone Trust. Medina Armory built of Medina Sandstone in 1903 currently houses the Orleans County YMCA. 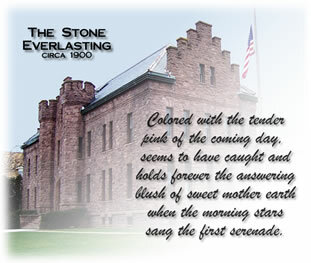 Excerpt taken from the publication, “Medina—The Stone Everlasting”, circa 1900, reproduced in 2007. Medina sandstone, formed by nature 400 million years ago, has been the “cornerstone” of the culture of Medina, New York which gave it its name. Discovered around the time of the digging of the Erie Canal in the 1820s and accepted as a superlative building material, it was quarried for over a century in Orleans County and shipped world-wide for architectural masterpieces. 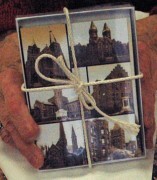 Find it in Buckingham Palace, Brooklyn Bridge, the NYS Capitol, thousands of homes, earlier in cobblestone streets. It has strength and integrity, plus unmatched beauty in many shades. It is the foundation for this society and the Sandstone Trust.